Save time, buy time, free time, find time, last time, this time, next time, make time, in the nick of time, out of time, a stitch in time ……. So much time, so little to do!!! Then how come so many people don’t have time? Is there not time enough for everyone? What time is it? The time is now. But is it the right time? How high is high time? Does it ever come down? Where do you keep spare time? If you ‘ve lost time, where do you look to find it? Is there a sign of the time, or is it well hidden? Is it time? Isn’t it always time? Are we not always in time? When is some time and any time? Is time good, bad, big or hard? How do you half time, or double it? How do you drink it up? Is time a square or a line? Can you make time? They say you can stitch it. Can you also knit it? Like a winter scarf. would time expand the way a waist band will when the stitches are cut? Did time just go by? How does time travel? Does it fly? How do you get over time? Is there a ladder or a counselor? Why is time mean in Greenwich? How do you save time? Is there a special piggy bank? Could you save a few minutes each day it rains to spend a longer day in the sun? Where can you buy time? Who sells time? But is time not free? 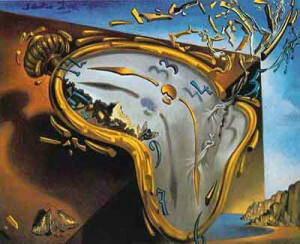 Is the nick of time a prison cell where time is incarcerated? If so how can we free it? And who kills time? Shouldn’t they be the ones incarcerated? Free time! It’s innocent of all charges! Thanks Fiona! Nice to hear from you! Working on my thesis . . .